Lots of organization chart examples created by Edraw HR Organizational Chart diagramming Software. Include human resource organizational chart, company organizational chart etc. Human resource departments are frequently asked to create organizational charts for their company to make it easy for executives and managers of the company. Employees need to understand company strategy and structure, and their roles in achieving organizational objectives. 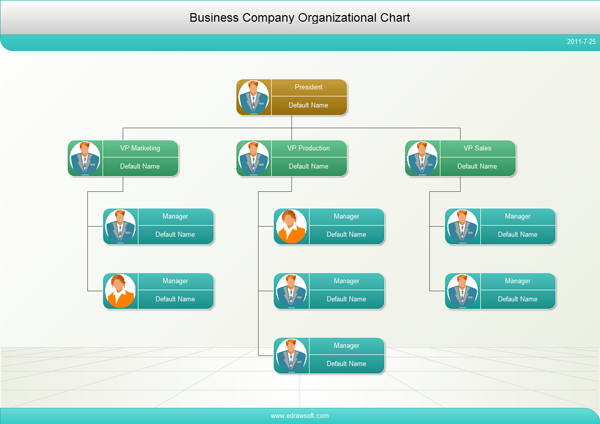 With Edraw Organizational Chart, you can create clear and comprehensive human resource organizational charts with no prior experience. As you can see by studying the sample organizational chart below, these types of charts are the ideal way to help HR professionals visualize their current structure, create scenarios to plan for change, and to communicate organizational information across the enterprise. Nothing is left unclear when structural relationships are illustrated with an organizational chart created with Edraw - the ultimate organizational chart software. Use it to create organizational charts, visualize human resource organizational chart, HR staff organizational chart, company organizational chart, department organizational chart etc. Perfect HR Organizational Chart Examples Created by Edraw! 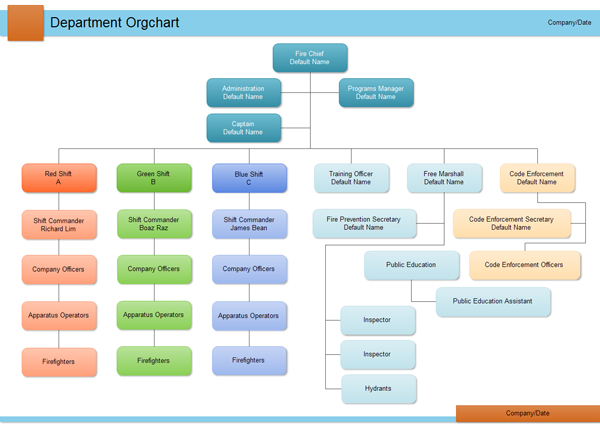 The following are some samples of human resource organizational charts. Proper organization structure is important for a company to function effectively. Communicating clear paths of responsibility is the key for a company to meet the needs of future growth as well as to help in streamlining the organization. An org chart is the ideal manner for mapping the organization. It is a tool for identifying personnel and managing the workforce effectively. An organization needs to visualize the company structure in order to understand the role each employee plays in the human resource chain. An Organizational Chart is a specialized tool used by Human Resources professionals to be able to get a solid picture of the organization. An organizational chart is generally deployed in situations when management wants to identify areas throughout the enterprise that represent opportunities for downscaling, also known as downsizing. For instance, by utilizing the full capabilities within an Organizational Chart Software, one can quickly identify workers at specific seniority levels earning above or below specified dollar levels. One can flag them within the organizational chart according to the needs of the human resources management.